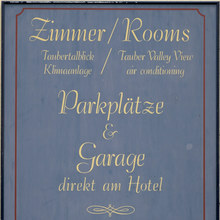 Designed by Lucian Bernhard about 1931 but not cut until 1933 [Reichardt] or 1934 [McGrew]. There is a companion set of swash capitals. Issued by Lettergieterij Amsterdam as Aigrette (1939). Triangle Type Foundry had it as Tango Script . Digital versions include Bernhard Tango (AKA Demi-Formal 421 , Bitstream, 1993), Carmine Tango (Monotype, both with insufficient kerning), Bernhard Tango FS (FontSite), and Bernardo (Intellecta Design, 2010). Latter is the only one to include the swash caps, but unfortunately it is of poor quality. Photo(s) by “Florian Fecher” on Flickr.